On 17 July 2018, an ancient lump from space thwacked into the moon with enough energy to produce a brilliant flash of light. 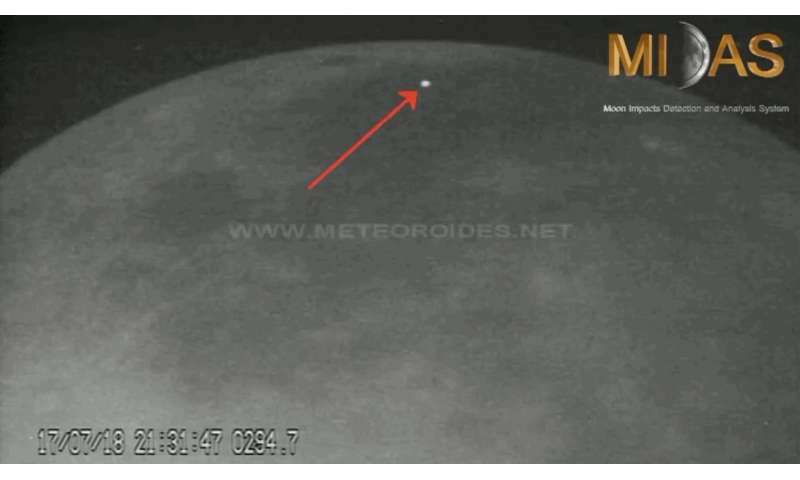 With another space rock seemingly in pursuit, a second flash lit up a different region of the Moon almost exactly 24 hours later (see GIF). Current estimates suggest these two impacting 'meteoroids'—fragments of asteroids and comets—were both about the size of a walnut. They likely originated from the Alpha Capricornids meteor shower—itself the result of Earth and the moon passing through the dusty tail of comet 169P/NEAT. For at least a thousand years people have claimed to witness short-lived phenomena occurring on the face of the moon. By definition these transient flashes are hard to study, and determining their cause remains a challenge. For this reason scientists are studying these 'transient lunar phenomena' with great interest, not only for what they can tell us about the moon and its history, but also about Earth and its future. The first systematic attempt to identify impact flashes began with CCD cameras dating back to 1997, and is continued today by the Moon Impacts Detection and Analysis System (MIDAS). With a series of telescopes endowed with high-sensitivity CCD video cameras, the MIDAS project is currently made up of three astronomical observatories across Spain. Working together in coordination, these instruments identify rocks hitting the dark faces of the lunar surface. Jose Maria Madiedo from MIDAS explains: "By studying meteoroids on the moon we can determine how many rocks impact it and how often, and from this we can infer the chance of impacts on Earth. In principle the upcoming July 2018 lunar eclipse should make it easier to observe any potential meteoroid impacts, but this will depend on how dark the moon becomes. At MIDAS we observe impacts on the 'dark side' of the moon, meaning impact flashes stand out against the dark lunar ground". Unlike the 'far side' of the moon which always faces away from Earth, the dark side refers to any part of the moon that is not currently illuminated by the Sun, although—such as during a crescent moon—it may still be facing Earth.